While all of us experience feelings of anxiety at some point in our lives, autism and anxiety tend to be more closely related than some might think. There are heaps of articles and blog posts citing the undeniable relationship between the two, and while it can be difficult to distinguish which behaviors are the result of autism, which are due to feelings of anxiety and stress, and which are a combination of the two, there is some pretty compelling evidence suggesting that individuals with autism are more likely than their neurotypical peers to develop anxiety orders over the course of their lives. The simplest definition I can think of as it relates to anxiety is the natural reaction our bodies have to a stressful event or situation. Sometimes, this fear is completely expected and normal (first day of school, first day at a new job, first date, etc. ), and in some instances anxiety can actually be helpful to us (ensuring we are prepared for important event, keeping us safe in dangerous situations, etc. ), but when the feelings are extreme, last longer than they should, and/or interfere with daily functioning, an anxiety disorder could be to blame. Research indicates that children on the autism spectrum are more likely to develop anxiety than their ‘neurotypical’ peers, and if you think about it, it makes total sense. In the face of communication challenges, sensory processing sensitivities, an inability to express their own emotions and understand the emotions of others, poor impulse control, and problems with self-regulation, it’s hardly surprising that children with autism may be predisposed to certain anxiety disorders. They live in a confusing world that isn’t overly accepting or forgiving of their struggles and challenges, and it’s hardly surprising that social situations and the like can become anxiety-provoking. Of course, it can be difficult to distinguish if the behaviors a child is exhibiting are a result of anxiety, autism, or a combination of both – only a trained professional can accurately make that distinction – but for the purposes of this post, we’ll focus on anxiety and autism and the best coping strategies. What does anxiety and autism look like? Again, it’s important to speak with a trained professional to determine the reasoning behind your child’s struggles and behaviors before you can put together a proper treatment plan as it can be difficult to make the distinction between autism and anxiety (or both). The GAPS diet is not intended to be a quick fix, and is a much more regimented protocol used to treat leaky gut, gut flora imbalances, and nutrient deficiencies, and if you do a quick search on Google, you’ll read some pretty powerful stories about the gut-brain connection and how the GAPS diet has helped children overcome symptoms of autism, ADD, anxiety, allergies, and more. CLICK HERE to learn more about the GAPS diet, how it can benefit your child, and for links to our favorite GAPS recipes for kids. Cognitive behavioral therapy (CBT) is a form of psychotherapy aimed at challenging an individual’s distorted thoughts about herself and/or the world, and equipping her with the skills and strategies needed to change her unhealthy thoughts, beliefs, attitudes, and behaviors. CBT was originally used to treat depression, but has since been proven as an effective treatment method for a range of other mental health issues including anxiety and autism. CBT does not focus on the past, but is instead designed to challenge an individual’s belief systems as well as the automatic thoughts she experiences in response to certain events, etc. This evidence-based approach can be helpful in treating anxiety and autism by educating the individual about her condition, teaching her to recognize the warning signs of anxiety, and equip her with effective coping skills and strategies. CBT has been successfully adapted for use with children and adults on the autism spectrum and can be used in individual, group, and/or family settings. If your child struggles with a specific fear or phobia, exposure therapy is another effective natural remedy for anxiety in children with autism. Exposure therapy (ET) is a specific type of cognitive behavioral therapy that can be very helpful to those who struggle with a specific fear or phobia. ET is usually performed over a series of 12-16 sessions, and has been proven to be an effective natural remedy for anxiety in children with autism as it challenges the ‘escape/avoidance’ behaviors that maintain and intensify anxieties over time. A trained exposure therapist works with the child to break down a specific anxiety-producing situation into several, smaller fears, and then rank them in order of intensity. The idea is to exposure the child to each fear – starting with the least anxiety-producing situation first – and have the child stay within the fear-inducing situation until her anxiety comes down. Distractions and/or avoidance behaviors are not allowed to be used, and the exercise is repeated periodically until it no longer causes fear. Once this occurs, the next fear-inducing situation is tackled until the child has overcome her fear completely. While very effective, it can be difficult to get a child to agree to ET, and reward systems can help make children more willing to participate. Finding natural remedies for anxiety in children with autism can be difficult. Diet changes can be challenging and the real benefits aren’t often seen for several months, and it takes time to find a trained therapist that specializes in anxiety and autism, with treatment plans taking upwards of 12 weeks. Also? What works for one child may not work for another, which can be extremely frustrating for parents and children alike. While you’re trying to find a solution that works best for you and your child, essential oils are gaining popularity for their ability to treat a variety of mental health issues including anxiety and autism. The calming effects of lavender oil can help kids sleep better, bergamot oil is a powerful relaxant and can reduce nervous tension, anxiety, and stress, roman chamomile oil can reduce mental anxiety, paranoia, and hostility, and is also a great stress-buster that has been found to help with insomnia and muscle tension, and jasmine oil works to regulate feelings of stress, anxiety, and over-excitement in the brain. Make sure to research your oils before you buy them, educate yourself on proper and safe use and dosing, and partner with a reputable company! CLICK HERE for our beginners guide to essential oils for autism and sensory processing disorder. Autism and anxiety can be intense and challenging to deal with, and we sometimes forget to put ourselves in our child’s shoes. We fail to remember that our child probably recognizes and worries that she’s different from her friends and classmates as a result of her anxiety and autism, and that worry probably does nothing but make her symptoms worse. Remind her that everyone experiences anxiety in their lives, and give her (appropriate) examples of things that cause you worry and what coping strategies you use to make yourself feel better so that she feels less alone. As tempting as it is to diminish your child’s anxiety by telling her to stop worrying – and as difficult as it is to keep your patience in check when your child repeatedly gets worked up over something seemingly inconsequential to you – it’s important to remember that your child’s fears are very real and scary to her. Anxiety can also be very isolating, and when you acknowledge your child’s fears in a supportive way, you will help her feel less alone. When our children feel stressed and anxious about something, our natural instinct is to find ways for them to avoid it. Out of sight, out of mind, right? Unfortunately, this sort of negative reinforcement only works in the short-term. While we may be able to keep our child’s anxiety under control through avoidance in the here and now, most anxiety-provoking situations cannot be avoided forever, and it is our responsibility as parents to set our children up for long-term success and help them find coping strategies. Yoga for stress isn’t anything new. Some of the benefits of yoga include mental wellness, relaxation, improved respiration and lowered heart rate, so it’s no surprise that many parents with children who suffer from anxiety disorders are turning to yoga for relief. The book, Yoga Therapy for Children with Autism and Special Needs offers parents, therapists, and teachers a great introduction to the principals of yoga and how different postures, breathing, and mindfulness techniques can help teach self-soothing strategies and promote better behavior, focus, strength, flexibility, balance, and (more importantly) self-regulation. Mindful breathing is a breathing technique for anxiety that teaches your child to slow down their breathing when feeling anxious or stressed. When anxiety hits, a child’s breathing pattern will change. Often they will take short, fast, shallow breaths, which can even lead to hyperventilation and passing out. This type of breathing makes anxiety much worse. Mindful breathing helps your child to focus on their breathing technique to make anxiety better. Mindful breathing is the perfect tool because it is portable and can be used anywhere at any time your child needs it. This is especially important when you can’t be there with your child to help. CLICK HERE for 10 of our favorite breathing techniques to help children with anxiety and autism. Talking through feelings of anxiety can be helpful, but if your child has a tendency to fixate on something that is causing her anxiety, and you find that her anxiety increases the more you discuss it, consider a ‘one and done’ approach whereby you discuss the issue once, and then table it for a later time. This ensures your child is able to express her feelings, and that she knows she can talk about it again if her anxiety elevates, while also limiting her ability to obsess over it. Another great way to cope with anxiety and autism in children is to ensure your little one has tools readily available when anxiety strikes. Fidget toys, squeeze balls, and chewing gum are all great classroom-appropriate ideas that can help reduce feelings of anxiety and restore a sense of calm. It’s no secret that children are motivated by rewards, and if your little one struggles with autism and anxiety, a great strategy to encourage her to face her fears is to motivate her with rewards. A sticker chart, special outing with mom, or extra time on the iPad are all easy but effective ways to encourage a child with anxiety to face her fears instead of avoid them. Teaching your child with anxiety and autism how to relax and take care of herself will not only help her find ways to cope with her emotions, but will also teach her how to prevent anxiety from occurring in the first place. Here are 11 activities to reduce anxiety in children both on and off the spectrum! Let your child and her therapist/teacher/mentor each hold toy phone. The adult can ask directed questions at the child, who feels less pressure when they can answer indirectly. Let them know if they feel uncomfortable, they can hang up. Blow bubbles and allow your child to run around and pop them. This is a great way to offer the child stress relief. There are any number of sensory play activities that children will enjoy that can help them feel relaxed and in control. Make or buy an art journal and let your child write/draw their emotions, thoughts and feelings into it. Then review periodically with them. Ask your child to draw a superhero and talk about the superpowers they’d like to have. Talk with them about their personal strengths and how they are their super powers. Puppets are a great way to communicate with kids, as it allows them to act out their vulnerabilities in a safe way, using imaginary characters. Pick a situation that your child is anxious about and role play through it with them. This will help them to visualize situations and prepare for them. Give your child a shoe box or other small box with a lid, and allow them to decorate it. Have her place negative or upsetting images inside the box, while decorating the outside with more positive and uplifting images. Ask your child about a nightmare or anxious thought she’s been having and then work through a happier ending for it. This can help retrain her brain to feel more in control. Buy or make a set of Guatemalan worry dolls. Assign a worry to each doll and then leave them in a bag or box. This gives your child permission to leave her worries with someone else. There are lots of great age-appropriate books about anxiety you can read with your child as well. Here are 5 of my favorites! Wilma Jean the Worry Machine. This is a fun book that tackles the concept of anxiety in a child-friendly way and offers creative strategies kids can use to feel better when big emotions strike. I love the Worry Hat idea, and the Wilma Jean the Worry Machine Activity and Idea Book offers fun ways for parents and teachers to engage with kids who are plagued with worries. What to Do When You Worry Too Much: A Kid’s Guide to Overcoming Anxiety. Perfect for kids aged 6-12, this is more of a self-help book for kids and parents, and it walks through the cognitive-behavioral techniques used to treat anxiety in an engaging, child-friendly way. The Kissing Hand. If your child experiences separation anxiety in relation to daycare, school, staying with family or friends, etc., I highly recommend this book. It’s a sweet story about Chester the raccoon, and the ritual he and his mom share to make saying goodbye easier. Zola! This is another fun book about a girl who worries about EVERYTHING, how she sought help, and what she does to cope. I Like Myself! I think every child should own this book as it reminds them to love all of the things that are unique about themselves, and if your child suffers from anxiety, this is a must-buy! Anxiety and autism is real. It’s complex and difficult to understand, and can be downright overwhelming at times, but we must remember that it’s often harder on our children than it is on us. And while our job as parents is to find ways to help our little ones function in the world, there comes a time when we need to think outside the box and figure out different strategies to help them cope with things we may never understand. I hope these strategies and activities help inspire you to find different ways to help your child with anxiety and autism, and if I can leave you with one more piece of advice when it comes to helping a child with big worries, it’s this: be there for her. Be your child’s safe place, remind her she’s loved, and never, ever give up. 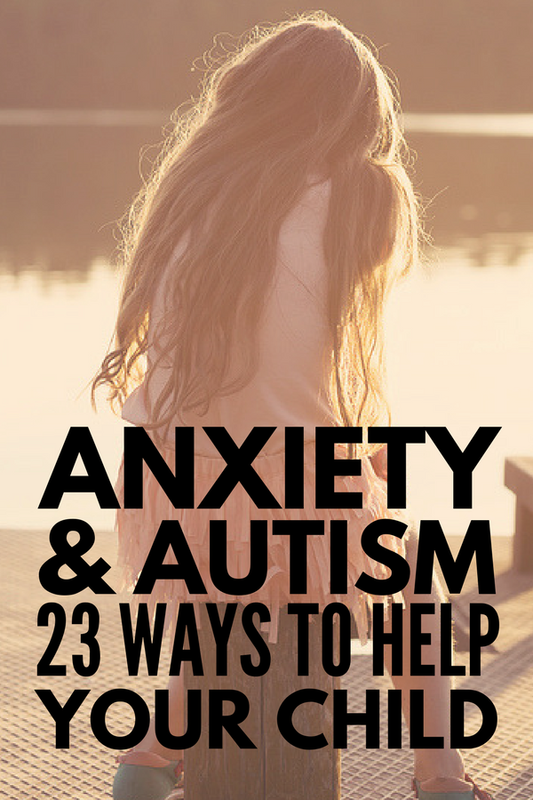 If you found these tips for helping children with anxiety and autism helpful, please share this post on Pinterest! And if you’re looking for more autism-related tips and tricks, please follow our Autism and SPD board where we share all kinds of helpful things we find each day!